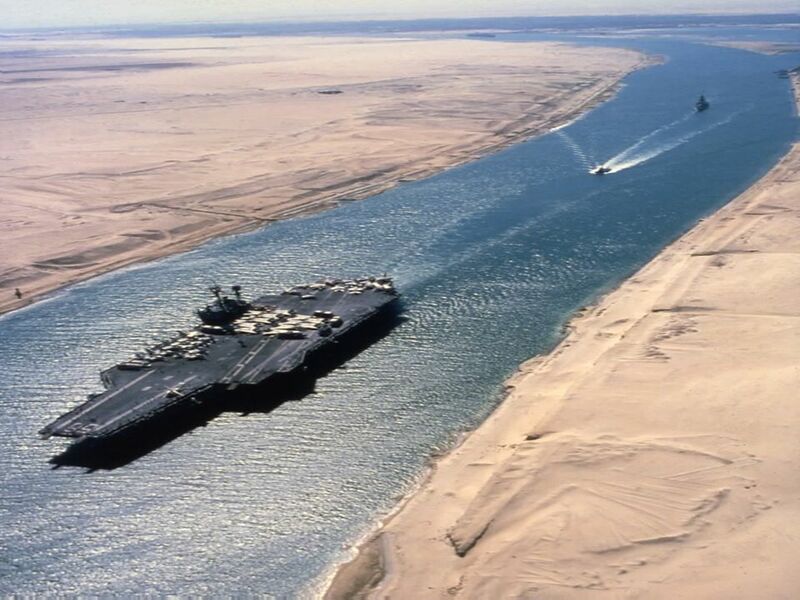 The Suez canal has no locks. It is a simple ditch from the Med to the Red Sea. 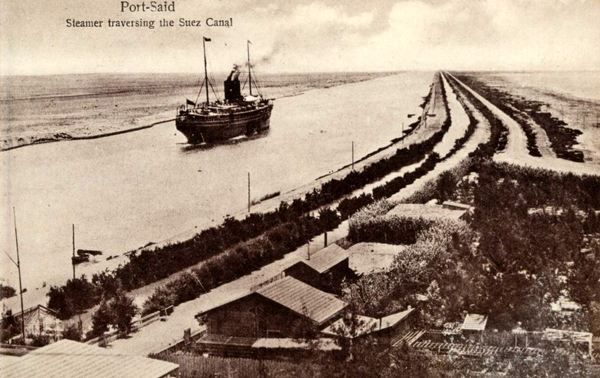 It is also much wider than the Panama Canal throughout its length. Two ships can easily pass each other in it. There is no place that could easily be blocked by a wreck or two. I also doubt the MAS boats could make the trip. It's hundreds of miles there and the same back. Yeah, nevermind that. You'd need 3 freighters full of concrete to block that for a significant amount of time. Based on GoogleEarth, the Suez canal's navigable channel seems far narrower than its overall width. I've measured a navigable channel width of 300 metres (it's marked with buoys visible on GE). Navigation could be realistically hindered for some period of time depending on channel depth and vessel draft. EDIT - The section I mentioned is in the Bitter Lakes section of the Canal, and given the premise, blocking it would depend on an enemy's ability to reach that section in the first place. Probably not possible. So my point is moot or difficult to pull off. Last edited by Imperial; 13 Mar 17, 12:02. Right. Using mines to close sea lanes is better than using Subs. To do that, you really have to have the Military put their foot down with Il Duce; he HAS to give them 72 hours warning, or they just take the initiative and get the subs out there at the first sign it is about to happen. Ramb I & II could also have been sent out, as indeed they were, but I think that re-arming them happened later, using guns from disabled DDs. - It was the mine belts and MTBs that prevented the heavier ships from escorting the Pedestal convoy all the way to Malta. Mines were a major factor in the Med and the North Sea, and even figured into the Pacific war on a large scale. And yes.... the Red Sea is about as long as the distance from New York to Miami. A couple years ago i discussed a game design for this subject with someone. 'Winning' was early on in the discussion defined as having Italy in a better position to negotiate surrender than in OTL. The best outcome was having no German forces in Italy when the time came to capitulate. So, we thought that the more grey German pieces the Italian player drew from the force pool the larger victory point penalty he received. Oh hell, inevitable capitulation and then back-stabing your own side? That's a pretty negative game! Hey, think I should take this to Axis History? Yeah, that would be a little crazy. But what would it take for Italy to push half a dozen Divisions all the way to Port Suez? Last edited by The Exorcist; 07 Sep 17, 12:59. Mines could have been a major issue in the Red Sea as shipping routes are quite constricted by coral reefs and the Red Sea is not that deep. However an early British air strike took out the Italian mine layers in the area. Subs in the Red sea would find it difficult because of the restrictions and lack of depth in many places. Free floating mines were outlawed before WW1. Nasser found it very easy to block with a wreck or two in 1956. German mine laying in the canal by aircraft was a major problem at first. Mines could have been a major issue in the Red Sea as shipping routes are quite constricted by coral reefs and the Red Sea is not that deep. That is what I was thinking; close the "gate of tears" with mines and torpedo-equipped SM.79s, the same combo that nearly wrecked Operation Pedestal. If you can do that, why would the forces way down there even think about the Suez? It is just too far away, even if the Italians take Port Sudan I don't think they have the reach to even threaten it, and they certainly don't have the force to waste on it. However an early British air strike took out the Italian mine layers in the area. They had more than one? All I heard was that Ostia was hit in a air-raid in port, and blown up with all its mines still on the racks. This, after the Italians opened things up with a declaration of it's own. Surely, this is one of the worst indictments of Italian "leadership" in the whole campaign. Subs in the Red sea would find it difficult because of the restrictions and lack of depth in many places. Free floating mines were outlawed before WW1. Free-floating mines were actually a thing? Sounds ridiculous to me, drift alone would remove them from the area you want to deny the enemy in days, at the most. Yes, the Italian subs preformed do badly I don't waste any time on them. Half were eliminated in the first week of operation, and the other 4 just gave up until it was time to run away. They were pretty good at that part, all of them slipped away and made it to France. Oddly (or perhaps not) they didn't even try to re-base themselves somewhere else, like Mogadishu or Berbera. ... not that I know of for sure, but didn't a German Raider encounter one somewhere around Somalia? Italian subs and Italian submarine doctrine were designed for a different kind of warfare - they were intended to act as ambushers of battle fleets and not for commerce war. Oh sure, all of the DDs at Massawa could lay anywhere from 30-100 at a go. Point is, as per my plans, all of them should have gone out the first night and laid all that they could. Declaring war the way Mousey did was just plain ridiculous. Between June, 6th and July, 10th, 1940, four antishipping and four antisubmarine minefields were laid by minelayer "Ostia" in both Northern and Southern Channels of Massawa, with a grand total of 270 antishipping and 200 antisubmarine mines. In the same timeframe, the destroyer "Pantera" laid two antishipping minefields at the Northern entrance of Assab, with 110 mines. The IN AMC "Parvati" sank on a mine of Assab minefield on April, 30th, 1941. The steam Tug "Taikoo" struck a mine (probably a drifting mine of the old italian minefields) on sept., 12th, 1941 and sank between Aden and Massawa. They went all defensive, but at least they were doing something. But you could use "drift" to carry them into an area that your mine layer could not penetrate. In 1939/40 Britain developed free floating mines to sow upstream in German rivers but took elaborate measures to ensure that they became neutral before reaching international waters. I think free floating mines became illegal in international waters as early as the Declaration of Paris. I didn't know that, very interesting. Last edited by The Exorcist; 07 Sep 17, 23:55. Mining the Strait of Tiran on the exit from the Red Sea is certainly doable technically. These are mostly less than 300 feet deep and Italian mines have a maximum setting depth of 200 meters. Free floating, drift mines were heavily restricted but not completely illegal by WW 2. They could be used but had to have a time of only a few hours at most before they had to become inactivated. The Italians had at least two types the British labeled IO and IN (I don't know what the Italian designations were). These could be dropped and had a 9 hour float time before they sank to the bottom. As they were contact mines, they wouldn't have been useful past their 9 hour float time. I think the idea was you could use them in a battle in some fashion but couldn't simply lay them wherever and let them drift through shipping lanes forever. AFAIK they were intended to be "laid" by a submarine in front of an oncoming battle fleet. As I said Italian submarine doctrine was to use subs to ambush battle fleets - a very old fashioned doctrine originally espoused by Jellico in WW1 who believed in the fast fleet submarine (like the disastrous steam powered K class). These would be large and fast (enabling them to keep up on the surface and get into position before diving and lying in wait). Such subs were not good at the quick crash dive and their underwater performance was poor. In WW2 they were vulnerable in conditions where there were significant numbers of ASW vessels and air cover. The RN soon abandoned the doctrine but the Italians had retained it as to a lesser extent did the Japanese. disgust of many a British Just William and Billy Bunter these sweets vanished from British shops and were used in a variety of maritime fuzes and the like. In the event the German advances in 1940 and 1941 meant that the planned launch sites for the British river mines became unavailable or unreachable and AFAIK they were never deployed. I have heard stories that SOE used a few in the Far East but have found no reliable source to confirm this - it would be in character though. In fact there were a great many free floating mines in both world wars - not deliberately sown but every time there was a storm numbers of mines would break free from their moorings in the various mine barrages both sides had laid. In 1919-20 and 1945-46 considerable effort had to be put into hunting and destroying such mines. The disappearance of some ships in these periods has sometimes been attributed to these (which makes a change from aliens, time warps etc). Last edited by MarkV; 08 Sep 17, 04:27. In the event the German advances in 1940 and 1941 meant that the planned launch sites for the British river mines became unavailable or unreachable and AFAIK they were never deployed. And the RAF mined the Danube later.